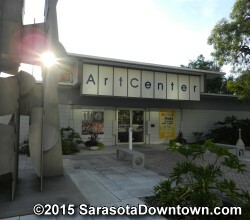 Art Center Sarasota is the hub of our Gulf Coast regions contemporary art scene The goal of the Art Center Sarasota is to present a broad spectrum of workshops, classes and exhibitions that emphasize the work of living artists. 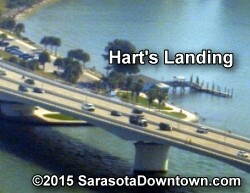 Hart's Landing (920 John Ringling Blvd. 941-955-0011) has been located on Sarasota's bay front since 1934. And remains operated by Dennis Hart, the son of the founder. Hart's Landing is Sarasota's oldest saltwater fishing bait and tackle store. It is accessible by car or boat and is located next to the Tony Saprito Fishing Pier and a children's playground. Snacks and beverages are available as well as bait and tackle. You can purchase your Florida Saltwater and Fresh Water Fishing Licenses including Snook and Crawfish (Lobster) stamps at Hart's Landing. Eloise Werlin Park (formerly Causeway Park) offers picnic tables, walking trails and a children's playground. Restrooms are available at the Hart's Landing building. The park was dedicated in 2015. 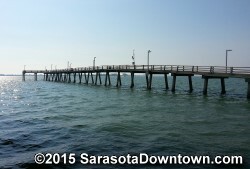 T.J. "Tony" Saprito Pier is open year round from 5 a.m. - 11 p.m. The Pineapple Drop is advertised as the biggest party south of Times Square. Join tens of thousands of your closest friends for the biggest New Year's Eve party south of Times Square. Towles Court is a privately owned artist colony that consists of 16 lots and 16 different owners. Towles Court is bounded by Adams Lane to the North, Morrill Street to the South, Links Avenue to the West and U.S. Highway 301 to the East. There are year 'round Third Friday Gallery Art Walks where all the lights are turned on and the galleries open their doors to the public in the evening (6-10 PM) for "Art by the Light of the Moon. at the "Stroll at Towles." There are also guided studio tours in February, March, and April which include three artist demos and lunch for groups of 12 or more. Just off Orange Avenue is the well known Burns Court Cinema which features many smaller independent film releases and is home to the Sarasota Film Society and Cine-World Film Fest presentations. The Sarasota Opera has achieved national and international status as a producer of world-class opera. The Sarasota Opera has been performing annually since 1960. 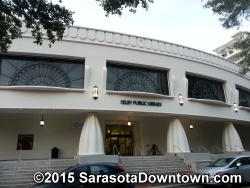 Selby Library was first established in 1907 as the first library in Sarasota County. The current building was constructed in 1998. The library features a large aquarium that forms the archway leading to the children's section. Meeting space is available, including a 200 seat auditorium. A number of public events and classes are held at Selby Library Monday - Saturday. The library holds more than 800,000 volumes and also offers Internet terminals. Unconditional Surrender is a statue by artist Seward Johnson. 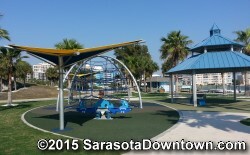 It is located in Sarasota's Bayfront Park and is a popular destination for photos and many re-enactments of the kiss. The statue is based on the famous Alfred Eisenstaedt's photograph V-J day in Times Square, published in Life magazine in 1945. 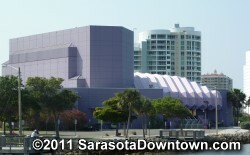 Van Wezel Performing Arts Hall is affectionately known as Sarasota's "Purple Cow" due to it's unique color. The hall presents a variety of stage shows from Broadway musicals to concerts by internationally known recording artists and comedians. Stars such as Pavarotti, Leonard Bernstein, Willie Nelson, Dizzy Gillespie, The Beach Boys and many more have performed at the Van Wezel. During the summer, the lawn adjacent to the Van Wezel is the site of four monthly concerts called Friday Fest on the Bay and features a variety of live music and a different band each month from June - September. Selby Gardens is perhaps best known for its living collection of more than 6,000 orchids. Selby's 11 bay-front acres are an open-air and under-glass museum of more than 20,000 colorful plants, many collected in the wild on nearly 100 scientific expeditions to tropical rainforests by the Selby Gardens' research staff. Seven greenhouses are the heart of botanical research and plant identification, for which Selby is internationally recognized. Main Plaza, at the intersection of Rt. 301 and Main Street is an indoor mall of shops, offices, restaurants and the Hollywood 20 movie theater. The Players Theater of Sarasota offers a variety of performances throughout the year including musicals, concerts and plays as well as a performing arts school for both children and adults. The theater is a not-for-profit organization. Although not in downtown, Ed Smith Stadium is just a short ride from any downtown location. Enjoy major league baseball every March in Sarasota as the boys of summer are playing baseball in Sarasota every March. Le Barge is like a giant houseboat with a bar and dance floor on the top deck and cocktail tables inside. Entertainment is usually a solo guitar player singer performing island style music and Jimmy Buffet hits. Le Barge sails several times a day around Sarasota Bay and offers a great view of the waterfront homes and spectacular sunsets. Be sure to bring the camera. Call for schedule. The Ringlings' Cà d´Zan has 56 incredible rooms filled with art and original furnishings. With its Venetian Gothic architecture the mansion is a Venetian palace and is open to the public for tours. 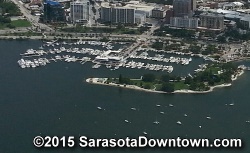 The Sarasota Bay Mooring Field offers over 35 permanent moorings designed for vessels up to 100 ft. in length. The mooring field is accessible through Big Pass and the Intracoastal Waterway. All moorings come with a host of great amenities including 2 dinghy dock locations, shower and laundry access, pump-out services. 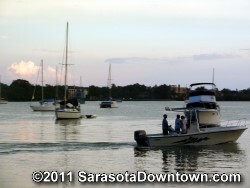 The boat basin at Island Park offers many choices for deep sea and other fishing charters. There are private fishing charters and group charters available at the marina. One attraction located inside Island Park is the Steigerwaldt-Jockey Children's Fountain. The Fountain is open April - October 10a.m.-5p.m. Daily, weather permitting. • Children 3 years old and younger must wear swim diapers • Fountain water is recirculated, do not swallow • Do not use Fountain, if ill with diarrhea. • Food, drink, and pets are prohibited inside fenced Fountain area. Just north of downtown is the Sarasota Jungle Gardens well known for their pink flamingos and performing birds. The Gardens is operated by a non-profit group and also features educational exhibits such as the "Reptile Encounter" and "Birds of the Rainforest"
For more Sarasota area attractions, visit 4Sarasota.com's Attractions page.